The Great Recession may have ended years ago, but many boomers are still supporting aging parents, adult children or both—and it’s negatively impacting their financial standing. A recent survey found that 1 in 4 baby boomers are financial supporters for a parent or adult child. These financial supporters are helping an average of 1.3 adults, and one-third are also caregivers. The average supporter has provided a total of $12,000 in the past 12 months to a parent or adult child. Most of this support is offered unconditionally, with no guarantee of repayment. Most supporters say they’re “very happy” to help a parent (64 percent) or an adult child (53 percent), and many are willing to do even more. One in three would delay retirement to help an adult child, and nearly 3 in 4 baby boomers say they couldn’t tell their parents that they’re “on their own” financially. All this help comes at a cost, though. Among financial supporters, 30 percent are living more frugally to make up for the cost, and 16 percent will have to delay retirement. If financial support is prolonged for years—and 69 percent say they will continue to help until their adult child finds a decent job—the impact could grow much worse. Many financial supporters, including boomers, saw their own financials take a hit during the crisis. 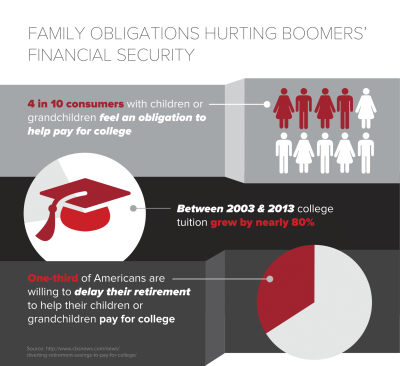 For example, the average baby boomer financial supporter holds an average of $114,000 in debt. In the event of a disability or sudden loss of work, many would be unable to continue supporting their children or parents—half say if they had to retire unexpectedly they could no longer offer the same level of financial support—and possibly themselves. Despite the reduced financial security, though, few boomers have discussed the problem with a financial professional. Only 1 in 5 have discussed the financial support of others with a financial professional, and only half have discussed it with the person they’re supporting. For more on boomers, sign up for our newsletter today.